It has been my experience that the topic of tofu brings up assorted emotional reactions. Some people are afraid of it, and stay as far away as possible. To those of you who fit in that category, there is help. Try this recipe. Perhaps it will convert you. As a vegetarian for practically my whole adult life, soy was a major staple in my diet. I made dips out of edamame, ate soy-filled energy bars, my freezer was filled with Morningstar Farms products (fake chicken, fake rib, fake you-name-it, I piled my salads high with “chik’n” and “soy medallions” from the Whole Foods salad bar, I used tofu in stir fries, and looked forward to eating my “not dog” with sauerkraut at summer bar-be-ques. However, after hearing some controversial and conflicting ideas about soy’s health effects, I stopped eating soy cold tofurkey in January. It was kind of like an experiment: Can a vegetarian go without soy? 1. Eating more than your fair share of rice and beans. Guess the consequence. 2. Missing tofu terribly, and gazing at it longingly in the supermarket freezer. 3. Plummeting stock of Morningstar Farms (I am just assuming). 4. Eating even more rice and beans. So, although I no longer label myself as a vegetarian, I still think carefully about incorporating lots of meat-free protein-rich sources into my diet, such as quinoa, nuts, and, well…rice and beans. When I got the napa cabbage and scallions from the CSA this week, I thought back to one of my favorite tofu recipes. The recipe below is adapted from Did Emmons Entertaining for a Veggie Planet. I began to wonder if perhaps eliminating something 100% was not necessary. Maybe, just maybe, moderation is the key to a healthy diet. And then I broke down, went out the the store, and bought myself some tofu. I know, I am such a rebel that I can hardly believe it myself. 1. In a large colander, combine the cabbage and salt and toss to coat. let stand for 30 minutes in the sink to leach out excess water. Rinse well with cold running water and drain. Pat dry with clean kitchen towels. 2. Preheat oven to 350 degrees and place peanuts on rimmed baking sheet. Cook until toasty, 12-15 minutes. Then, chop and keep the peanuts aside for now. 2. Wrap the block of tofu well with a clean dishtowel and press firmly until you feel the towel become damp. Unwrap the tofu and cut it into 1/2 cubes. In a large, well-seasoned skillet, heat the canola oil over medium-high heat. Add the tofu and salt it liberally. Fry the tofu undisturbed until it forms a dark golden crust on the bottom, then use a spatula to turn it an brown it well on at least one more side. Drain well on paper towels. 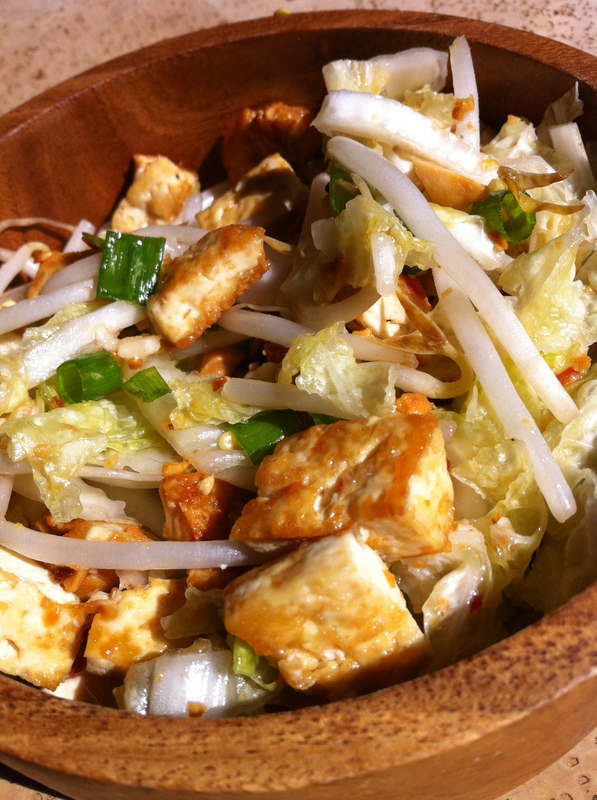 Transfer the tofu to a large bowl and add the cabbage, bean sprouts and scallions. In a small bowl, whisk together the chile paste, ginger, garlic, sugar, and vinegar until sugar dissolves. Right before serving, pour the dressing over the slaw and garnish it with the peanuts. first of all…..i missed the part about stopping cold tofurkey the first time, and I cant stop laughing when I “got it” this time….secondly…I give this recipe 2 yums up! “Fresh” brought it to a fun luncheon at my house last week. I kept it on my side of the table. I don’t share well when I really like something!